Why not make your wedding magical? 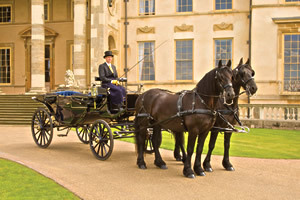 A horse-drawn carriage is the perfect way to arrive at your wedding in style. We have what it takes to make your day a truly memorable experience. Our original Victorian carriage is drawn by two stunning black Fresian horses and can be decorated to complement your chosen flowers or colour scheme. The carriage can be used open or fully closed, ensuring your occasion is a success, regardless of the weather. This carriage can carry four people. We have other horses and carriages, so your entourage can also travel in style – we can tailor our carriages to suit your personal needs.